Good morning from a sunny corner of Cumbria. A few weeks back I attended the Minerva Meet Up. I am sure from other blogs you would have already read details of the day. It was a well organised and well attended event, and it was great to finally meet some other bloggers, readers and sewists in real life. The Minerva Crafts store itself is laden with amazing fabrics and of course I did end up buying some fabric, including this navy blue 100% washed linen (at least I think it is that one…that’s the only one I think it can be from the website). The fabric is gorgeous. It has a wonderful weight to it, and was a pleasure to sew. It was a considerable purchase, which is why I wanted to go for a fairly classic design. This is a dress I hope I will wear for many summers to come. The pattern is McCalls 6696 (you remember I made the slip from this pattern in my last post). 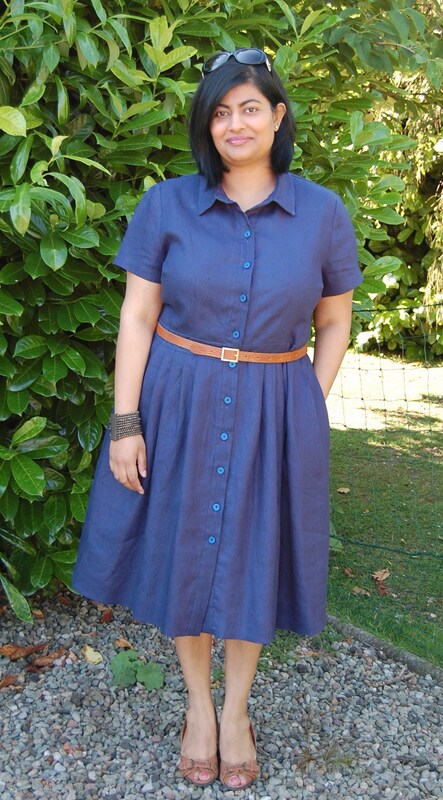 I love the finished dress, although I don’t know if I need to do a very slight FBA next time around (even though this is one of those patterns that has multi-cup sizes, which generally work well for me). I love the pleated skirt and the waist band. I wish I had added the belt loops (I had even cut them out), but left them off last minute because I thought it would restrict what belts I could wear with this. Here’s the back view: I removed 1.5 inches from the centre back pattern piece, which was then cut on the fold, thereby effectively eliminating 3 inches in total. 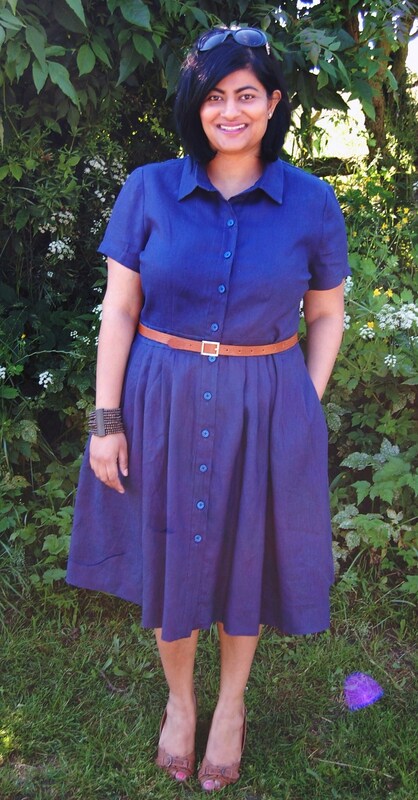 In my last shirt dress review, I tried using Andrea’s method of attaching the collar…and had mixed feelings. Well, I tried it again, and have to say this method has definitely grown on me….the results are much more precise. 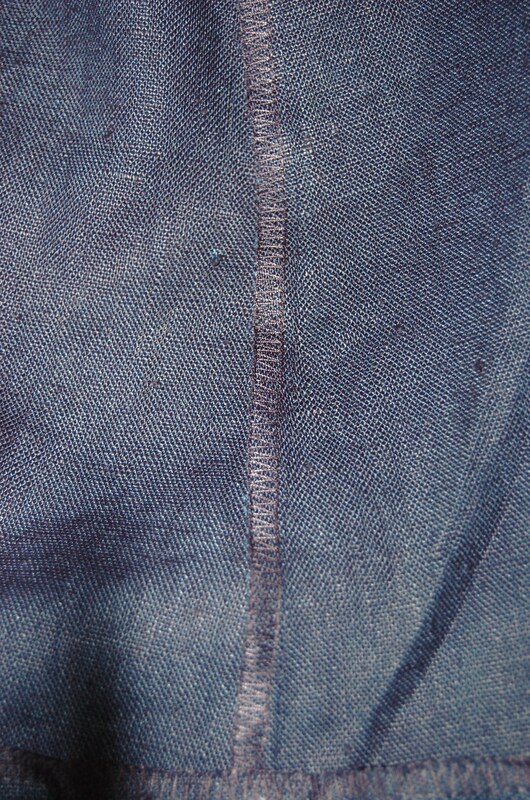 I just serged the insides for a clean finish (3 thread wide overlock). Dresses have collar, collar band, self-lined yoke back, close-fitting bodice, and band. A: carriers, purchased belt. A,B: pleated skirt, side pockets. 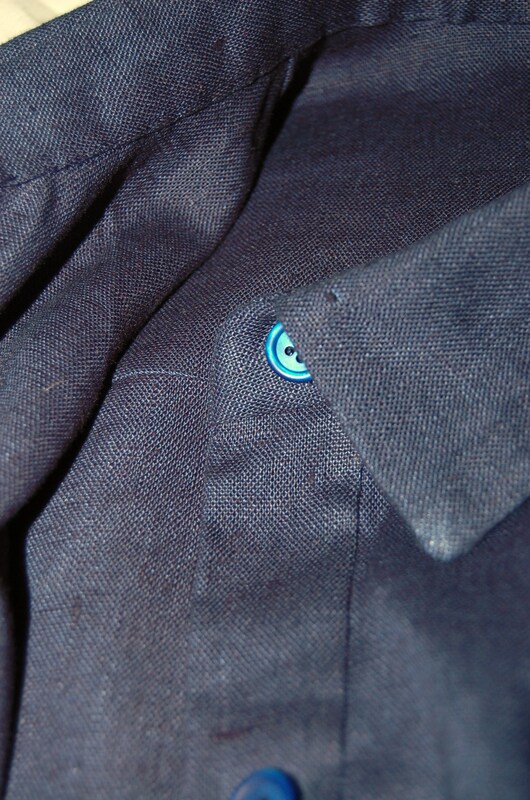 A,C: purchased bias tape finishes armholes. D: sleeve bands. C,D: semi-fitted through hips, side front pockets, stitched hems. Bias, close-fitting slip has shoulder straps and very narrow hem. A/B, C, D cup sizes. I love the finished shape, with the pleated, full skirt and the waistband. Great for my figure. There is a fair amount of hand sewing involved in this dress….normally I would have topstitched everything, but with the linen it just didn’t look right, so hand sewing it was. I wish I had added the belt loops. 100% washed linen with a great weight to it. Minimal, although next time round I don’t know if I would do a very slight FBA or just cut the next cup size up. The only changes I made were to add an inch to the length (though probably not necessary), and do a 1 inch sway back adjustment. Oh, and I removed 1.5 inches from the centre back pattern piece, which was then cut on the fold, thereby effectively eliminating 3 inches in total. I had to get creative again with the cutting layout, just squeezing this dress out of 3 metres of 137cm/ 55 inch wide fabric. I ended up cutting my waistband in 2, so it has a join in the centre back. I used the burrito method to attach the yoke, but did do all the other hand stitching as required. Yes, I would consider sewing this again….maybe the straight skirt view (view D). I have made the slip, now I have made the dress…and I am still not done with this pattern. Highly recommend, especially for curvy ladies. I have 2 weeks to sew a swimming costume, a cover-up and attend a bra making course next week. Eek! Stay tuned to see if I can complete all my sewing before we head off to Barcelona in a couple of weeks. Until next time…. I love this dress! Looks great in the fabric you’ve chosen, very classic choice. I am going to be making this dress this month too, my fabric is all cut out and ready! It looks terrific on you! Thanks Nessa. Look forward to seeing your version. Really pretty and classic. You’ll wear this for years to come. Such an awesome dress, and I’m sure it will get worn plenty.. This looks great on you Manju. I love it with the tan accessories. I love it and am sure you’ll be able to wear it for many summers to come. Why not try adding thread loops which you can make large but are inconspicuous enough to wear with smaller belts as well! Thanks rachelle. Yeah I also thought of thread loops…I guess it’s an option…just think the carriers would have looked smarter. What a gorgeous dress, it looks great on you. The colour is beautiful – must have a look at that fabric! Just discovered your blog after seeing you are a fellow White Tree Fabric blogger! I just love this dress. It is really lovely on you. I shall enjoy looking through the other things you’ve made. Hello lucie how lovely to meet you 🙂 I will check out your blog (and the other bloggers) soon as I can! that looks fantastic, what a great choice of fabric for that style. love it. Gee, you look wonderful in this dress. Nice style; nice fabric. Love it. That fabric looks dreamy to wear, such a pretty dress. Beautiful dress…I love the color and it fits you perfectly!!! Well done! Everything about this dress works well for you. Great job! Mind if we share this on our social media? Email us at Facebook@mccallpattern.com. Thanks! You are so adorable I just love your blog. I have been so inspired to sew garments, I wish you lived closer so you could teach me lol! thank you for sharing your lovely blog love Frances. This is a winner! It looks stunning, I don’t think you need a bigger cup size, there is plenty of space around the back. The pleats make the skirt hang really nicely. What beautiful fabric! Details are everything, and your buttons and bracelet are truly inspired choices! Beautiful…but why am I not surprised 🙂 You know me & a good pleat….hmmm! Ooh that is cute! 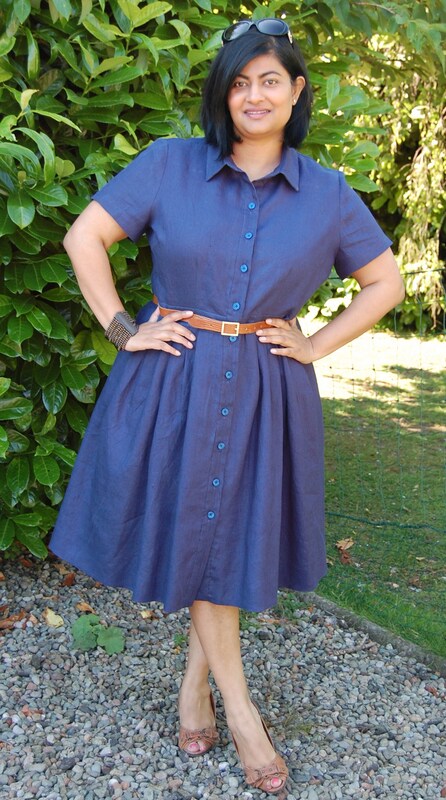 I have made a shirtdress with a notch collar before but really like this style so might treat myself to the pattern. Thanks for the inspiration! Such a great pattern and so perfect in solid navy linen. I am a huge fan of this! I’ve only made the straight skirt but I’ll have to make the pleated version too. You look so good in this colour!